Dealing with a car that just won't start up due to weather, collision, or electrical issues? With just one call, our towing specialists will be there to take the vehicle back to our shop for repair services. You'll appreciate our affordable towing services and our guarantee that your vehicle makes it back to our shop safely. 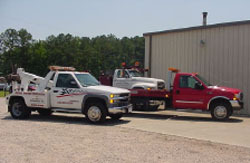 For fast towing services, contact us at 252-792-2350. Maybe you have been in an accident or perhaps your car has just failed to start up due to mechanical problems and you need to have it towed to the garage. If it is not an emergency, all you need is towing during business hours only. To have the car towed to the garage during business hours, contact Jimmie Council's Auto Repair. At Jimmie Council's Auto Repair, we offer professional towing services during business hours. Give us a call at 252-792-2350.